During the 1970's and 1980's, 62 WHEN had become exceedingly popular both with its listeners and advertising partners. Good reason...a fun and exciting station to listen to and be a part of. For advertisers...BIG Station + BIG Signal = Extraordinary results! 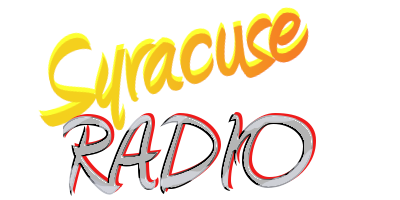 Never a station to rest on its laurels, WHEN continually promoted its presence in Syracuse and Central New York market. In the late 1970's and early 1980's it was not uncommon for the station to have 100+ billboards showing throughout the region... to say nothing of the massive number of iconic WHEN license plate logo bumper stickers distributed. Additionally, the station also promoted to their existing and prospective clients on a continuous basis. An example is at left. 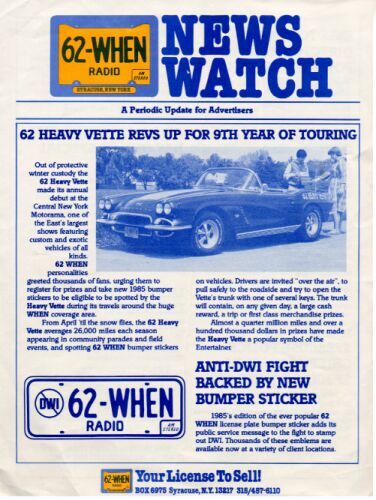 This, a 1985 promotional piece, featuring the ubiquitious "62 WHEN Heavy Vette." Pictured with the Vette at a local appearance are Cindy Thomason, Promotion Director and Ken Baglino.